In Bali I discovered so many fruits I didn’t know existed, it was such a revelations. 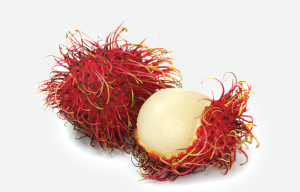 Rambutan and longan both reminded me of the litchi. While durian, with its well known bad smell, was more creamy and sweet. I liked it the first time and somehow, couldn’t eat again after that. I have tasted the jackfruit fresh, in ice cream and in jam. I had salak twice, but would have a really hard time to describe the taste. 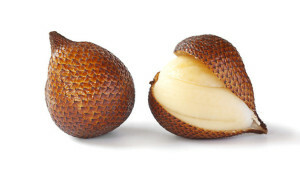 It has a scaly skin to which it owes the nickname of snake fruit. 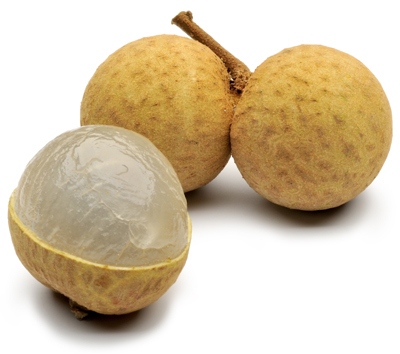 My favorite discovery was the mangosteen with its slightly acidic taste that reminded me of passion fruit. All these fruits were discovered thanks to Arya, my host in Bali, and her family. Salak, I discovered when she introduced me to her colleagues. 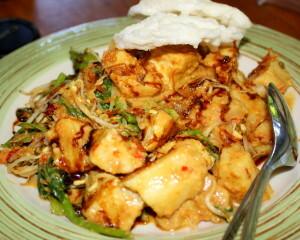 This meal is made of rice cakes mix with vegetables and Balinese style peanut sauce and was eaten with indonesian rice crackers. I tasted this in Arya’s hometown. I remember it being quite spicy. You can read up on how to make it here. I had it first when I stayed at Eco Serenity. I had it again many times after that. 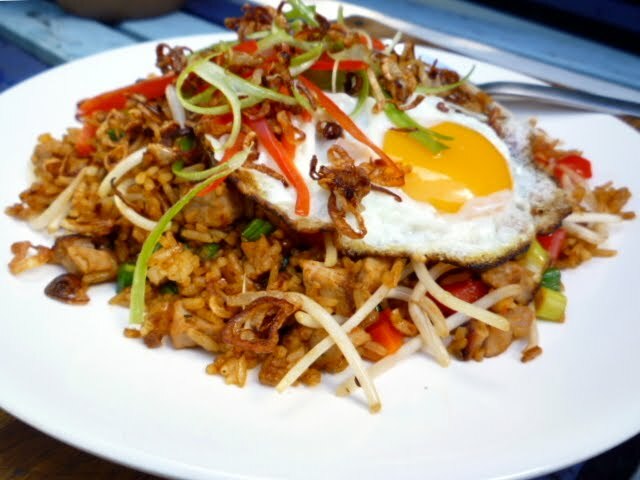 Nasi goreng is a Balinese fried rice and quickly became a favorite of mine I swore to reproduce at home. You can find a recipe for it here. There are many variation, but this one reminded me of what I had for breakfast almost everyday at Eco Serenity. 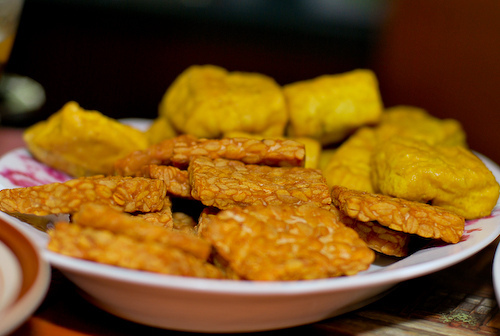 Tempe goreng are patties that you can dip in spicy sauce. I will probably try to make it back at home to bring to potlucks or something. Perfect as a snack, it was crunchy and surprisingly tasty! You can find a recipe here. 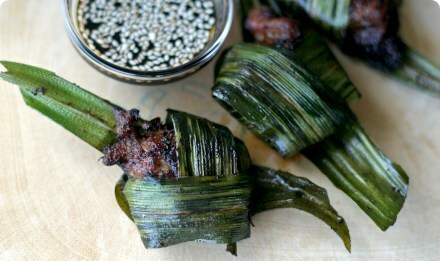 Ayam goreng was chicken wrapped pandang leaves. It was so moist and tender! I really loved it. Again, this would be perfect to bring to a party! You can find the recipe here. 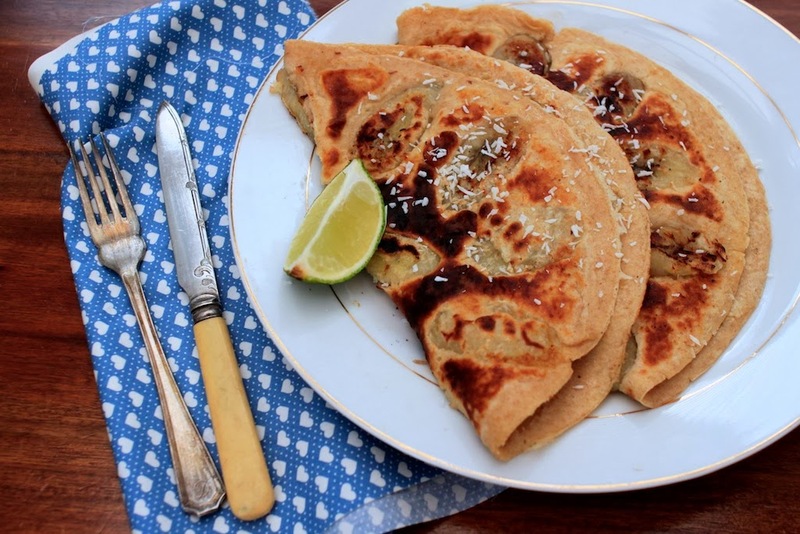 Another one of my breakfast favorite, Balinese banana pancakes were sweet and light. It felt like I was eating dessert for breakfast. It felt sinful, but I’m sure it wasn’t. They were more like crepes than pancake though! You can find a recipe for them here.